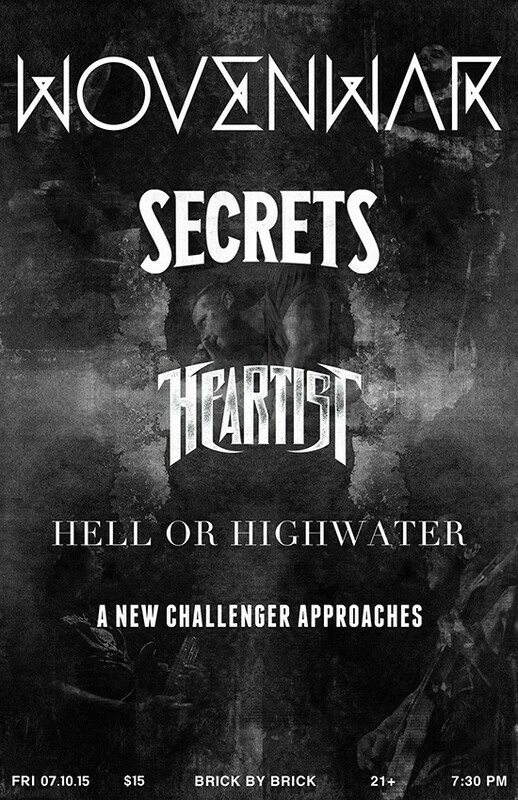 San Diego’s Wovenwar, along with special guests Secrets, Heartist, Hell or Highwater, and A New Challenger Approaches, will be putting on a special show at Brick By Brick on July 10th. The show takes place during one of the largest comic conventions in the world, San Diego Comic-Con. Those who are in town for the convention July 9-12 might want to take a night off from comics/games/movies to check out a metal show at Brick by Brick! The July 10th show is 21+, doors are at 7:30pm, and the show starts at 8pm. Tickets are $15 in advance and at the door. Tickets are available now through Ticketfly here: http://ticketf.ly/1Qn7ObE. Get there early! The bar is hosted by Sailor Jerry from 7:30PM – 8:30PM. Death to Rights, the latest video from Wovenwar is streaming online now at metalblade.com/wovenwar. The clip was directed by Josh Knoff and Nick Hipa. Wovenwar‘s self-titled debut was released in August of 2014 and landed at #36 on the Billboard Top 200 charts. On iTunes, the album peaked at #2 on the rock charts, and #1 on the metal charts during its week of release. In Germany the album landed on position 41 in the official Media Control Charts.